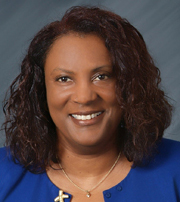 Dr. Vivian Yates has served as the Dean of Nursing at Cuyahoga Community College in Cleveland, Ohio since 2013. She is responsible for the management of a multi-campus nursing program that includes practical and associate degree nursing programs with traditional, LPN to RN, and accelerated tracks. Over 800 students are enrolled in the programs with 42 full-time faculty. With over 35 years in the nursing profession, Dr. Yates has a background in clinical nursing, academia, nursing administration, and nursing program accreditation. Her clinical background is medical-surgical and psychiatric nursing, serving in both clinical and managerial positions in hospital settings. She has over 25 years of teaching and administrative experience in nursing education; teaching in baccalaureate, associate degree, and practical nursing programs. Her research background includes examining the various facets of cultural diversity in nursing and health care. Dr. Yates has extensive experience in the area of nursing education accreditation. She served as the Associate Director for Program Accreditation Support for the Accrediting Commission for Education in Nursing (ACEN) in Atlanta, Georgia from 2009 – 2011. She began serving as a site visitor in 1997, and served on several Evaluation Review Panels from 2000 – 2009. She has served as a consultant for nursing programs across the country and has presented at national forums on nursing program accreditation. Dr. Yates is a member of several national and state nursing organizations including the American Nurses Association, the National League for Nursing, the Ohio Council of Associate Degree Nursing Education Administrators, and the Organization for Associate Degree Nursing. She has served as vice-president and president of her local chapter of the Ohio Nurses Association. She is a member of several nursing advisory boards in northeast Ohio, and serves on the Board of Directors at University Hospitals in Cleveland. Dr. Yates earned an associate’s degree in nursing at Lorain County Community College, a bachelor’s degree in nursing at the University of Akron, a master’s degree in nursing at Kent State University, and a PhD in education at the University of Akron.